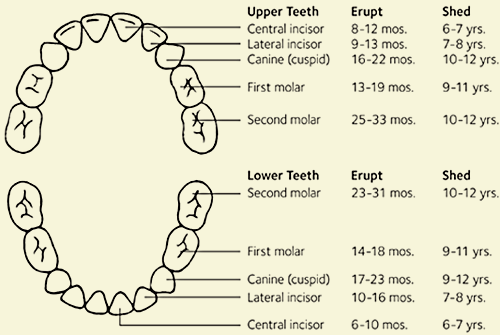 Newborns usually have no visible teeth; most baby teeth begin to appear generally about six months after birth. 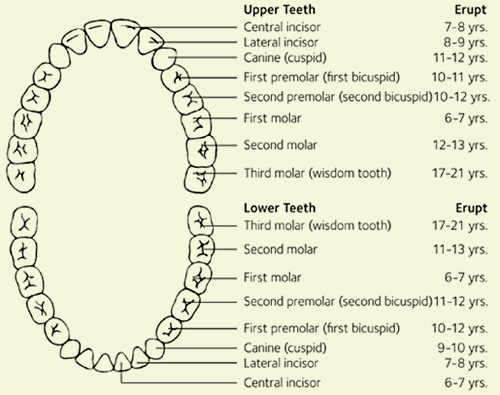 During the first few years of your child’s life, all 20 baby teeth will push through the gums and most children will have their full set of these teeth in place by age 3. A baby’s front four teeth usually erupt or push through the gums at about six months of age, although some children don’t have their first tooth until 12 or 14 months. As their teeth erupt, some babies may become fussy, sleepless and irritable, lose their appetite or drool more than usual. Diarrhea, rashes and a fever are not normal symptoms for a teething baby. If your infant has a fever or diarrhea while teething or continues to be cranky and uncomfortable, call your physician. When infants are born, almost all of their primary (baby) teeth already have formed. These teeth are still hidden in the gums. They usually begin to erupt or cut through the gums at about 6 months of age. Some babies get teeth earlier, and some get them later. That’s OK. Your 1-year-old may have a different number of teeth than your neighbor’s 1-year-old. Usually, the two front bottom teeth come in first. Next are the four front top teeth and two more bottom teeth. From here, teeth slowly begin to fill the mouth. Teeth usually come in two at a time, one on either side of the jaw. Your child should have all 20 primary teeth by the time he or she turns 3 years old. You should continue to help your children brush their teeth twice a day until they are 8 years old or can show that they can do a good job on their own. Brush after breakfast and before bed. Keep your children’s teeth free of food particles, especially the molars. Molars have lots of little grooves and crevices. Food particles can hide there and act as food for bacteria. Your dentist also can place sealants on your children’s molars to protect them from decay. But it’s still important to brush and floss. When your child is still very young, you can cradle his head in one of your arms and use your other hand to brush. Once children have the coordination and dexterity, they can brush on their own. However, be sure to inspect after each brushing and go over spots your child may have missed. Use a soft nylon toothbrush with a pea-sized dab of fluoride toothpaste. Teach your child to spit out the foamy saliva. As soon as any two of your child’s teeth touch each other, floss between them. After age 9, children can floss their own teeth. Flossing removes food from between the teeth where a toothbrush can’t reach. Talk to your child’s dentist or doctor to be sure he or she is getting the right amount of fluoride.